The ICC Cricket World Cup has partnered with Facebook to produce a series of branded content videos featuring interviews with past cricketing greats. The Weekly Corner with Cricket Legends is Facebook’s latest exclusive partnership as the social network amps up its presence in video. The weekly six part video series featuring cricketers from India, England, Sri Lanka and Australia kicked off with an interview with Shane Warne. 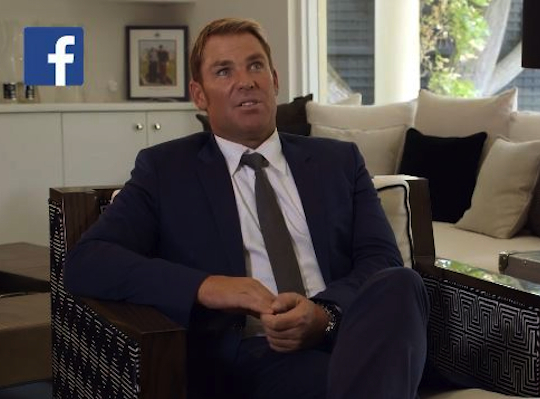 In the five minute video, Warne makes World Cup predictions and discusses his career highlights, including revealing his favourite victory and toughest opponent. Facebook says the interview, which follow’s Warne’s controversial prediction that the Australian team couldn’t win the World Cup without injured captain Michael Clarke, is “sure to provide further spice” for fans. 100 million cricket fans are on Facebook across the world, says Facebook’s head of media partnerships, Australia and New Zealand, Karren Rogers.